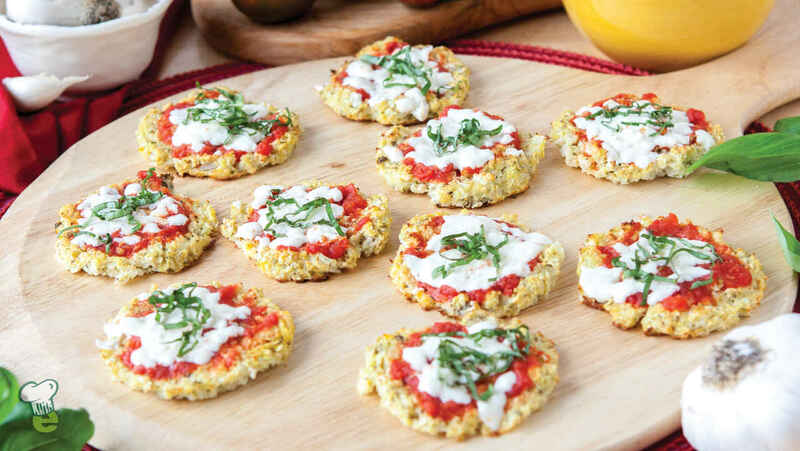 These light pizza bites have a cauliflower crust, making them low-calorie and a great appetizer for anyone who needs a gluten-free diet. Preheat oven to 400°. Lightly coat a baking pan with nonstick cooking spray. In a bowl, combine eggs, cauliflower rice, almond flour, coconut flour, garlic, 1/8 teaspoon of the salt, 1/4 teaspoon pepper, the Italian seasoning and red-pepper flakes. Scoop 2 tablespoons cauliflower mixture per pizza bite, place on the baking pan, and press down to form crust. Repeat with remaining cauliflower mixture. Bake for 25 to 30 minutes, until fully cooked and golden brown. In a small bowl, combine the tomatoes, oregano, remaining 1/8 teaspoon salt and black pepper to taste. Top each cauliflower pizza with about 1 teaspoon of sauce and 1 teaspoon of cheese. Bake for 5 minutes, or until cheese is melted. Let sit for a few minutes. With a metal spatula, gently remove the pizzas from the pan and transfer to a plate. Top with shredded fresh basil and serve immediately.